As a part of the Birgland regional registered society at Sulzbach-Rosenberg the folk dance group of the BirgIänders has existed since 1947. They perform Upper Palatinatel Bavarian figure dances according to tradition and sometimes also according to their own arrangements. At present, the group comprises 12 couples of mixed age and is an integral part of the society. All year round, the dance group takes an active part in many folklore evenings and folk dance festivals in the Upper Palatinate/Bavarian region. The appearances at a big international folklore dance festival in the Munich Olympic Hall, for example, with about 4000 participants from 35 nations and a complete 60-minute May dance in the Kettelerhaus ballroom at Rosenberg with Radio Bavaria received attention beyond the regional borders. Having been invited to foklore events abroad - twice to South Tyroli Italy, five times to France, three times to Finland, once each to Russia, Denmark, Hungry, Austria, the Czech Republic and Spain as well as to an extensive journey to the Far East (Japan/Korea) with stays of several weeks in each country, the group has become well-known far beyond the national boundaries of Germany. The 40-minute appearance on Japanese NHK-Television in Kumamoto in May 1991 and the production of 3 high-circulation series of phonecards by the Nippon Telephone and Telegraph Company showing different motifs of the regional folk dance and music group during their stay in Japan reveal their great success in particular. Sulzbach-Rosenberg and the area around it as guests of the local member families. As part of its broad public relations campaign the Birgländer Folk Dance Group has published its own picture postcard in order to promote the local area. The dancers "costume" renewed according to original patterns from the Sulzbach Birgland by Hanns Binder, folklorist and custodian of local traditions, was given excellent awards at an all-Bavarian national costume show in Munich. 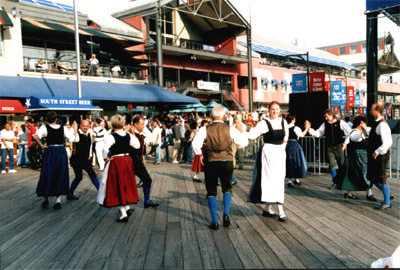 The amateur folk dance group, deriving pleasure from its work, also plays an important and widely recognized role in the Bavarian folk dance movement. Their dancing appearances mainly take place together with the Birglander Music Band. Consisting of about 10 musicians, this band plays very good Upper Palatinate and Bavarian brass band music and has often been awarded first and second prize. In the past few years it has successfully taken part in many folk music programmes and studio recordings made by Radio Bavaria. The band has also produced two LPs and cassettes featuring their own music.